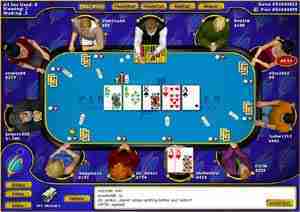 Planet was the first site to offer online poker for real money in January 1998. Mike Caro was part of the original team but has since moved on. 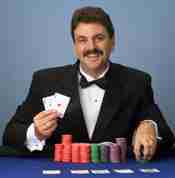 Roy Cooke is now the cardroom manager and regularly participates in games on the site. Although Planet was first, they were soon eclipsed by Paradise with faster, more attractive software and a much more aggressive marketing approach. Planet experienced some security problems in 1999 when a flaw in their shuffling algorithm was revealed. Thousands of dollars were refunded to customers. Support features are good with 24-7 live chat and toll free telephone support 1-866-424-2155. Micro-limits are available down to .05 - .10, the lowest on the internet. With it's new "next generation" software upgrade, Planet has gone from being relatively crude to one of the best. The latest incarnation has features never before seen including customizable betting buttons, info boxes and hand histories available through the card room itself. The chat has a nice feature converting some common abbreviations into sound. For instance, LOL will produce an audible laugh or TYVM will play the voice of Elvis saying "Thank you very much". Also supported is razz and lowball draw, unavailable at any other site. First time deposit bonus of 25% up to $50. Points are awarded based on play and can be redeemed for tournament entries or merchandise. Other periodic promotions. http://www.planetpoker.com/promos/.